Learn how to construct basic and advanced sentences by familiarizing in Tagalog affixes, nouns, verbs, adverbs, and adjectives. This app is more than just a dictionary. 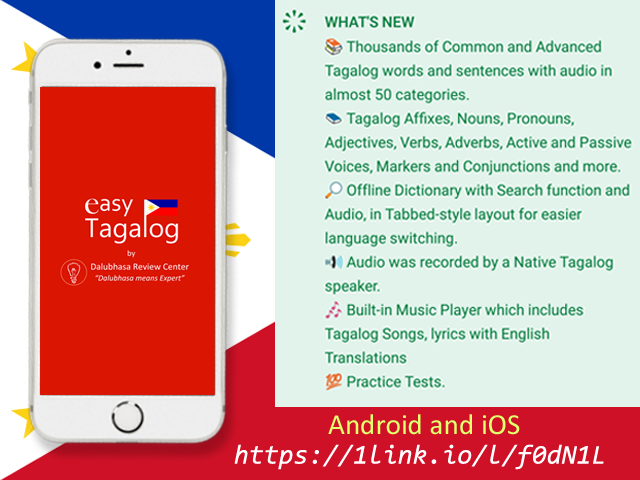 Learn useful common and advanced Tagalog words that have examples of sentences with English Translations and audio recorded by a native Tagalog speaker in almost 50 categories. You can also learn Tagalog slang and how to construct Taglish. Practice Tests are also included. This app also offers asking for a schedule whenever you want to talk to a native Tagalog speaker online.